Today was the end of the first phase of Scarlett’s treatment. She did very well as usual. She started with blood work. Her Hgb is still low but is stable. Her platelets were higher so there wasn’t a risk of bleeding today. Her WBC count is higher so she has less risk of infection. She is starting to recover. 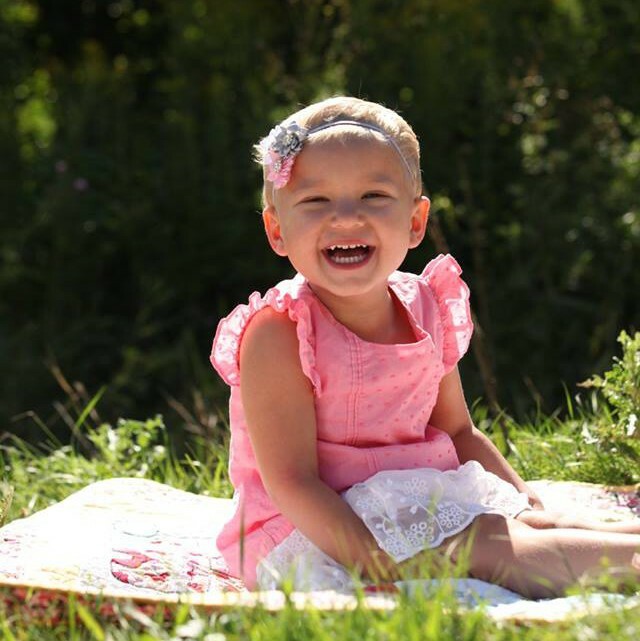 Her bone marrow is making the right cells again instead of the leukemia cells. Unfortunately, the next phase will wipe it all out to make sure the leukemia is gone for good. Next she had her port inserted. The anesthesiologist had 10 milliliters of propofol to sedate her. He gave her 1 mL and said she was half way there. The little stinker took another 2 mL before she even laid down. Then, on our way down to radiology she woke up and had to be resedated. She is so stubborn about not falling asleep that she even fights sedation! It took about an hour to place the port. The port is a little cushion type circle with a tube that goes through her blood vessels to her heart. The nurses can put a needle into the port to give her medications and draw blood. They don’t have to find a vein for an IV. After that were her lumbar puncture and bone marrow. The lumbar was first. After the fluid was drawn a medication was put back in. This chemo is injected straight into her spinal fluid to eliminate any leukemia cells in the spine. Although she never had any, we want to make absolutely sure that her cancer isn’t spreading. After that she had her bone marrow. Both of these procedures are done in a procedure room so that we can be with her. Most of the time I don’t watch things like that but today I did. They needed to get 5 mL of bone marrow. It took more than one “poke”. The doctor has to drill into her pelvic bone to draw out the marrow. It looked like it took a lot of effort! I know that the NP doing it was pretty tiny but she really had to put all her effort into it. Now it will be sent to Seattle. We should find out her results on Tuesday. We will have the next week “off”. It will be nice not to have to have blood drawn or drive to Green Bay (not that it’s all that far). But we can stay home and be normal for a week. The following week we start consolidation (phase 2). It begins on Tuesday with an overnight at the hospital and 4 consecutive days of chemo. The next 8 weeks will be intensive chemo and lumbars on weeks 1-4 and 8. I’m going to stop my daily updates now. I will continue with at least weekly updates and if anything important happens. We will continue to share pictures and important moments. We so greatly appreciate all of the support. Please continue to think of us and pray for Scarlett. We love visitors and phone calls. Sometimes it gets lonely when we have to stay home so much. We will keep taking good care of Scarlett and sharing her story. Love to you all!